We are at a point in time where medicine is coming back to whole body health care from a reductionist view that has dominated the conventional medicine world for the past several hundred years. Just like a pendulum that swings back and forth, science has also swung from one point of view to another throughout history, from healing through shamanic rituals to using pharmaceutical drugs to make a change in the body at the molecular level. As the pendulum slows down, we are able to integrate worldviews of both conventional and integrative/functional medicine into an integrative whole person model that utilizes the best of both worlds without sacrificing one or the other. There is a place for chemotherapy, radiation, and surgery for treatment of cancer; but based on latest research, we know that there is a place for the mind and the spirit as well. Integrative and functional medicine incorporate and realize that healing, with a whole being platform or the seven pillars of health, takes place on all levels and includes spirituality, mind-body, immunity, nourishment, detox, lifestyle and targeted therapies. (1) In fact, in psychosomatic medicine, it's often understood that a person's mental state and outlook on life, such as having hope, could have an influence on the course and severity of a physical disease such as cancer. Western science has been divided ever since the seventeenth century when Rene Descartes, the philosopher and founding father of modern medicine, developed his theory on the mind-body problem known as the Cartesian dualism, in which the body and the mind are viewed as separate entities. Interestingly, this happened when Descartes was forced to make a deal with the Pope in order to get the human bodies that he needed for dissection. He agreed he wouldn't deal with the soul, the mind, or the emotions, which were under the jurisdiction of the church at the time, if he could claim the physical body for his own study. And sadly, it has been like this for Western science and medicine ever since, where most of the medical establishment has been forbidden to bring the mind into discussion. Today, conventional oncologic treatment consists of chemotherapy, radiation, and surgery. But my experience with thousands of patients over the years has solidified the belief that they aren't enough to cure cancer or other medical problems. In the conventional approach, a patient is tested for cancer by mammogram, ultrasound, confirmed by biopsy, and then given a cancer diagnosis with a prognosis that has a time limit. When a time limit is given, all the patient hears in their mind is a death sentence and this fear in itself prevents the patient from healing. In other words, the mind has a powerful impact on the outlook of the course of the disease and this, of course, is not taught to the doctors or mentioned to the patients in the conventional world. Cancer is a disease of the whole person, not just one body part; and yet most conventional oncologists treat cancer as a separate entity or as a specific problem in the body. Their aim is to kill the cancer cells and remove the tumor from the body rather than heal the body from within and understand the environment and condition of the patient, to understand what set the stage for the cancer to develop in the first place. If the tumor is just removed but the environment stays the same, the cancer is sure to develop again. Circulating tumor cells (CTCs) or cancer stem cells (CSCs) are cells that break off from the original tumor and float around in the bloodstream looking for their next "nest" to settle in and are responsible for 95% of all metastases and cancer deaths. (2) Scientists have not figured out how to eliminate them through chemotherapy, radiation, or surgery. Instead of building up the immune system to help the body heal on its own and fight the cancer, conventional treatments tear it down and can sometimes create new health problems for the person due to immune suppression. If we re-frame our mind to look at the whole person and the environment for what caused the cancer to develop in the first place, then that's where all these other factors such as stress, diet, environment, the mind, the spirit, and all other aspects of the patient come into play. The body is an intelligent organism with a magnificent biochemistry and has a self-healing capacity. And it's possible that cancer is one way that our body lets us know that something is off-balance, or maybe the cancer itself is a healing mechanism for warding off an outside invader, or for holding an emotional trauma. Whatever the case may be, we need to re-frame our mindset as medical doctors and scientists and help to revolutionize the thinking pattern of our patients if we truly want to treat the origin of the illness or the cause of the cancer. Some emotional risk factors for cancer include chronic exposure to stress hormones, adverse childhood experiences (ACEs), depression, post-traumatic stress disorder (PTSD), alexithymia (inability to express one's emotions), attitudes/beliefs/nocebo effect, and lack of meaningful connections. Bruce Lipton, PhD, presents in his book The Biology of Belief that it isn't our DNA that control our biology, but our environment, thoughts, and beliefs that can turn our genes on and off through epigenetics. (15) When someone falsely believes that they're getting a medication and gets better symptomatically, when in fact they're getting a sugar pill, it's known as the placebo effect. (16,17) This placebo effect or belief effect as Bruce Lipton calls it, stresses that our perceptions, whether they are accurate or not, impacts our behavior and health. When a person perceives love, it was found that the growth genes were activated through the placebo effect. Similarly, when a person perceived a negative environment such as fear, anger, or hatred, the body went into fight or flight mode and the immune system and vital organs were neglected. Just as much as someone could get better with the placebo effect, the opposite can happen through what's called the nocebo effect, when someone believes that they will get worse or will die from a disease. A study found that patients who thought that they were going to die from cancer were more likely to do so than those who didn't have these thoughts. (18,19) Therefore, a patient's belief and perception of their diagnosis is very important in the course and outcome of their disease. It wasn't known until after 1973 when Candace B. Pert, PhD, discovered the opioid receptor, that the body makes its own opioid called endorphins that act like morphine. Known as the mother of psychoneuroimmunology (PNI) and someone who brought the gap between the mind and body closer, Candace Pert calls these neuropeptides the "molecules of emotion" due to the fact that these molecular peptides have an effect on our mind and emotions. (13) According to Pert, our emotions are what glues the body and the mind together and runs all the systems in the body since emotional expressions are always tied to a specific flow of peptides in the body and the spinal cord site that filters all incoming bodily sensations have receptors for almost all these peptides. For example, it's through these molecules of emotions or peptides that an embarrassing thought can turn a face red. But how do emotions have an effect on our health? These neuropeptides are in constant communication with our immune system, and the immune system itself produces peptides as well to modulate our health. Interestingly, viruses use the same receptors as these neuropeptides to enter into a cell; and depending on how much of the natural peptide is present, the virus will have either an easier or harder time entering a cell. This means that the state of our emotions will have an effect on the level of neuropeptides produced and thus whether we succumb to a viral infection or not. It can be deduced from this that being in a certain emotional state, such as an elevated mood, may protect against certain viruses. In 1990, Hall's study showed that psychological factors such as relaxation and guided imagery, self-hypnosis, biofeedback, and autogenic training, could directly affect the cellular function of the immune system i.e. the stickiness of the white blood cells as measured by saliva and blood tests. (20) And knowing that cancer is tightly linked with the immune system, it's easy to extrapolate that our emotions may be linked with cancer development. The immune system is what's responsible for the constant destruction of erroneous cancer cells that are developing in each one of us at every moment. Based on an analysis of over 1,500 cases of radical remission of cancer patients and research in 10 different countries, Kelly Turner, PhD, found that there were nine common healing factors in most of these remission cases. (21) Only two of the nine factors were physical (diet and supplements) and the remaining seven all had to do with emotions, mind-body connection, and spirituality, i.e. releasing suppressed emotions, increasing positive emotions, taking control of your health, following your intuition, embracing social support, deepening your spiritual connection, and having strong reasons for living. We have seen similar amazing remission cases at the Cancer Center for Healing as well that have demonstrated the power of positive thinking on the patient's healing journey. For example, a 54-year-old female diagnosed with ductal carcinoma of both breasts in April 2016 did not want conventional treatment. After being on an integrative treatment protocol for six months, the cancer mass in her left breast disappeared, and the 10 cm x 8 cm mass in her right breast disappeared after 10 months of being on the protocol. The patient always had a positive attitude throughout this whole time and had a belief that she would treat her cancer naturally. Cancer is a multi-factorial disease and requires a multi-faceted treatment approach that integrates the mind, body, and spirit. Conventional treatment deals with the physical body only and forgets to address the mind and spirit, which we know from Kelly Turner's book that seven out of the nine healing factors were all emotional and spiritual in nature. As it can be seen in the above patient example and from Kelly Turner's analysis of numerous remission cases, the mind is powerful. To summarize, our beliefs lead us to feel emotions, such as fear, stress, joy, and hope, which creates hormones/peptides that direct our bodies to either fight or flight or go into repair mode. Therefore, it's important for us to revolutionize our ways of thinking as doctors and to revolutionize the thinking pattern of our patients for them to have hope, to manifest love and joy, instead of instilling fear in them by giving a time limit without any alternatives. If we are to treat cancer and heal the whole person, it will be imperative for the practitioner to recognize that the mind plays a powerful part in the success of the patient's healing and to take this into consideration when talking with the patient and to also bring this knowledge to the patient in a way that they can utilize. 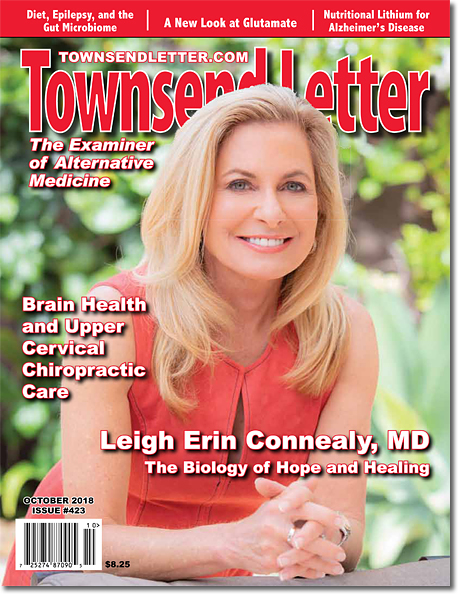 Leigh Erin Connealy, MD, is a prominent leader in the integrative/functional medicine medical field (taking the best of all sciences, including homeopathic and conventional treatments). She is the medical director of two amazing clinics: "The Cancer Center For Healing" & "Center For New Medicine." The combined clinics have become the largest integrative medical clinic in North America, and visited by patients from all over the world. Dr. Connealy is the author of two books, The Cancer Revolution published in 2017, and prior to that the Be Perfectly Healthy book in 2009, and has revolutionized the landscape of medicine. In 2017, she was named one of the top 50 functional and integrative doctors in the country. Dr. Connealy feels we must treat "the whole person," the patient with the disease and not the disease of the patient, while determining the "root cause of the illness." Dr. Connealy begins a TV Series "Dr. Detective" airing on the JUL-TV Television Network beginning in June 2018. She has discovered that many factors contribute to the disease process; therefore, many modalities must be used to reverse it, spending the proper time with each patient to allow for reversal of the disease. Dr. Connealy and her team of practitioners make this happen each and every day at her multi-disciplined "state-of-the-art" clinic, while providing quality of life treatments. Dr. Connealy has 31 years of experience and has taken numerous advanced courses, including homeopathic, nutritional and lifestyle approaches, while studying disease, chronic illness, and alternative or integrative/functional medicine cancer treatments. In addition, Dr. Connealy imparts her wisdom in educating medical practitioners from all over the world as well as, public speaking engagements, webinars and podcasts. She offers the most scientifically and technologically advanced equipment and protocols at her clinic located in (Southern California) Irvine. The Townsend Letter is dedicated to examining and reporting on functional and integrative medicine. Our editorial content depends on support from readers like you, and we would appreciate your help to keep this content forthcoming. Please take this opportunity to contribute, and ensure that our independent voices keep up the good fight against the skeptics, who would like to silence us and eliminate your medical freedoms. 1. Brandt A. The Healing Platform: Build Your Own Cure! 2016. 2. Connealy LE. The Cancer Revolution: A Groundbreaking Program to Reverse and Prevent Cancer. Da Capo Lifelong Books; 2017. 3. Gidron Y, Ronson A. Psychosocial factors, biological mediators & cancer prognosis: a new look at an old story. Curr Opin Oncol. 2008;20:386-92 (LOE-B). 4. Courtney JG, et al. Stressful life events and the risk of colorectal cancer. Epidemiology. 1993;4(407-14). 5. Lillberg K. Stressful life events and risk of breast cancer in 10,808 women, a cohort study. Am J Epidemiol. 2003;157(415-23). 6. Sephton S, et al. Diurnal cortisol rhythm as a predictor of breast cancer survival. J Natl Cancer Inst. 2001;92(994-1000). 7. Thornton L, Andersen B, Carson W. Immune, endocrine, and behavioral precursors to breast cancer recurrence: a case-control analysis. Cancer Immunol Immunother. 2008;57:1471-1481. 8. Reiche E. Stress and Depression-induced immune dysfunction: implications for the development and progression of cancer. Int Rev Psychiatry. 2005;17:515-527. 9. Chandwani KD. Cancer-Related Stress & Complementary & Alternative Medicine: A Review. Evidence-based Complement Altern Med. 2012. 10. Temoshok L. Personality, coping style, emotion and cancer: towards an integrative model. Cancer Surv. 1987;6(3):545-567. 11. Giese-Davis J, et al. Emotional expression and diurnal cortisol slope in women with metastatic breast cancer in supportive-expressive group therapy: a preliminary study. BiolPsychol. 2006;73(2):190-198. 12. Giese-Davis J, et al. Exploring Emotion-Regulation and Autonomic Physiology in Metastatic Breast Cancer Patients: Repression, Suppression, and Restraint of Hostility. Pers Individ Dif. 2008;44(1):226-237. 13. Pert CB. Molecules Of Emotion: The Science Behind Mind-Body Medicine. Simon & Schuster; 1999. 14. Last W. Cancer and Emotions: The New Medicine of Dr. Hamer. 2017. 15. Lipton B. The Biology of Belief. Hay House; 2016. 16. Pennebaker J, Seagal J. Forming a story: The health benefits of narrative. J Clin Psychol. 55(10):1243-1254. 17. Rosenkranz M. Left-prefrontal brain activity (happy brain) associated with best immune response to influenza vaccine. Proc Nat Acad Sci. 2003;100(19):11145-11152. 18. Milton G. Self-Willed Death or the Bone-Pointing Syndrome. Lancet. 1973:1435-1436. 19. Voelker R. Nocebos Contribute to a Host of Ills. JAMA. 1996;275(5):345-347. 20. Hall HR, et al. Voluntary modulation of neutrophil adhesiveness using a cyberphysiologic strategy. Int J Neurosci. 1992;63(3-4):287- 297. 21. Turner KA. Radical Remission: Surviving Cancer Against All Odds. HarperOne; 2014. 22. Monti D, et al. Neuro emotional technique effects on brain physiology in cancer patients with traumatic stress symptoms: preliminary findings. J Cancer Surviv. 2017;11(4):438-446.